First thing that I did was chop up about 2-3 cups of Broccoli. I added a handful of shredded carrots and chopped half a red onion, set aside in a bowl. Next I chopped up and added to a separate bowl: the Butternut Squash, Eggplant, Green and Yellow Zucchini, and Red Bell Pepper. Now, in a large pot (since we have a lot of veggies!) we are going to heat about 2 Tbsp of Olive Oil and 2 Tbsp of Garlic on Medium-High heat. You now add your broccoli, carrots, and red onions. Cook for about 3 minutes, stirring occasionally. We now want to slowly add your big bowl of veggies (Squash, Eggplant, Red Pepper, and Zucchinis). Add some more Olive Oil to coat the veggies so they do not get stuck to the pot. Cover your pot and fully cook vegetables (about 10-15 minutes), stirring occasionally. Once vegetables are cooked, add your Spinach/Kale, Grape Tomatoes, Basil Leaves, Oregano, Onion Powder, Garlic Powder, Italian Seasoning all to taste! Gently stir until Spinach/Kale is cooked. Serve veggies topped with your favorite marinara sauce. Chop up all your vegetables and separate into three bowls. First bowl contains Red Onion, Broccoli, and Shredded Carrots. Second bowl contains Butternut Squash, Eggplant, Yellow and Green Zucchini, and Red Bell Pepper. Third bowl contains Spinach/Kale and Grape Tomatoes. Heat a large pot on medium-high heat and add about 2 Tbsp of Olive Oil and 2 Tbsp of minced Garlic. Add your first bowl of Broccoli, Carrots, and Red Onion. Stirring occasionally, cook for about 2-3 minutes. 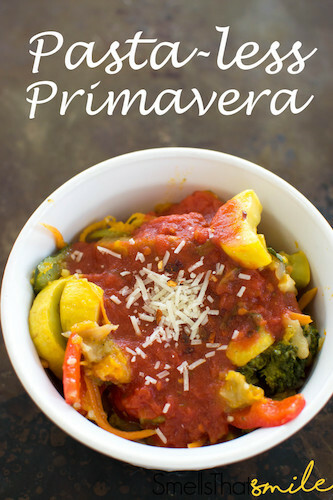 Add your second bowl (Butternut Squash, Eggplant, Yellow Zucchini, Green Zucchini, and Red Bell Pepper). Add a little olive oil if it’s looking dry. Stir veggies coating them with the olive oil so it does not stick to pan. Cover and fully cook vegetables, stirring occasionally (about 10-15 minutes). Once fully cooked, add your spinach and or kale, tomatoes, basil leaves and other seasonings to taste. Gently stir until spinach/kale are fully cooked. Serve veggies topped with your favorite marinara sauce.